This week I took advantage of a huge sale at my local fabric store and stocked up on some new lengths of various fabrics -- not like I need any more but it's always irresistible. I have had this pattern (New Look 6602) for a very long time, and I've been wanting to make it up for a while now. I finally found the perfect fabric on the sale table, a nice cotton/linen blend that I've been eyeing for some time. I was able to pick it up for $2.50 a metre! 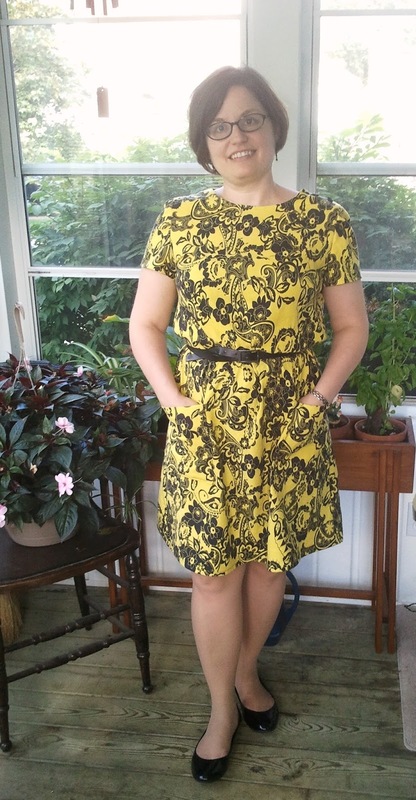 So I quickly ran up a dress, and it was quick -- this pattern is very simple but has two features I particularly liked. 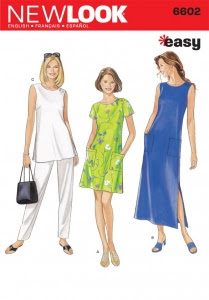 First, pockets, and then self-lined sleeves, which creates such a nice edge. It turned out a little too shifty for me, so I added a belt. I'm going to try again with a different fabric and remember to shorten it a bit so I can wear it shift style. But I am pleased with the way it turned out. It's comfortable and cheery, and I love having pockets. A necessary feature for functional clothing! Love this fabric!! you are so talented!